Imagine a week on an island off the coast of Maine. No cars, no stores, no streetlights…just good company, good food, starry skies, blue horizons, and long days spent almost entirely outside. These are the essentials for Arts and Birding, a week-long program I facilitate each year at the Hog Island Audubon Camp. Because I’m teaching, I don’t have time to complete much artwork of my own, but I did manage a few pages. And as always, I came away inspired to keep observing, sketching, and sharing my work with the wider world. Notes: (Clockwise from top) It’s not all birds! 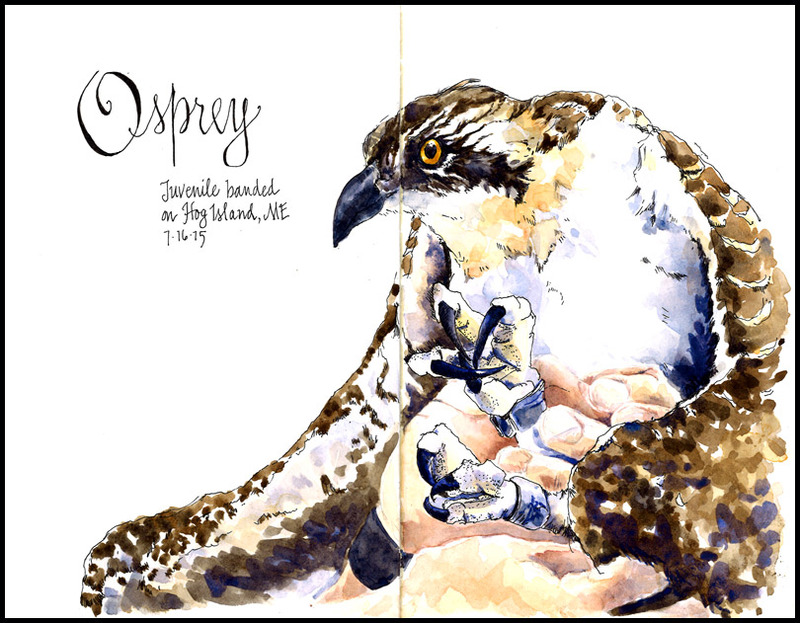 We also explore and sketch coastal scenes, plants, and life in the watery realm between high and low tide; Hog Island has a great collection of bird specimens, including a drawer of bird eggs; Young osprey nesting on the island are banded by wildlife biologists each year. 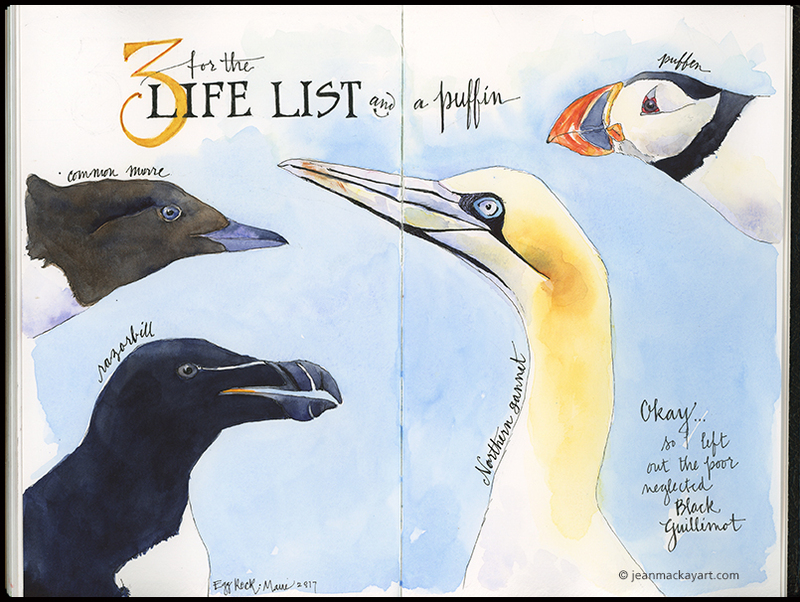 It makes for fast sketching, but it’s a thrill to see these birds up close; Just the essentials for a week of Arts and Birding. Arts and Birding is open for both sketchers/painters and photographers. Here’s a few photos from the week taken by photography staff and participants. Registration for Arts and Birding 2019 opens in October; the session often fills quickly. Stay tuned here. 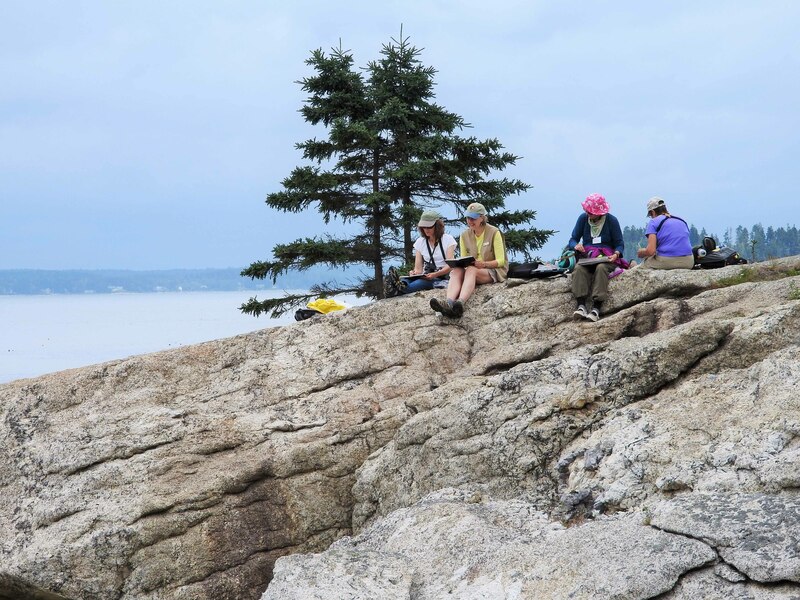 Join me next summer for a fabulous week on the Maine Coast! Registration opened yesterday and there are just a few spots left. Find details and images on the Workshops page or at the Hog Island website. If you love sketching or photographing birds and nature, want to improve your skills, and have a fun week exploring the beautiful rocky coast of Maine, join me for Arts and Birding at the Hog Island Audubon Camp, June 11-16, 2017. Being in on the island as program director for this session is one of the highlights of my year! We still have a few spaces in both the sketching/painting track and the photography track— so please read on and consider being part of this incredible experience. Beginners to advanced participants are welcome! Photography Track– This session is scheduled at the height of bird nesting season, so you’ll have opportunities to photograph birds and chicks–including osprey, eagles, puffins, terns, and songbirds–at their most active and colorful time of year. In addition to birds on Hog Island, you’ll visit several mainland hot spots and photograph puffins and terns on Eastern Egg Rock while aboard the Snowgoose III. You’ll also be able to take advantage of magical dawn light and evening sunsets to photograph island landscapes. National Geographic Photographer Drew Fulton and former Boston Globe columnist and photographer Derrick Jackson will offer daily skill sessions and share their expertise in the field. Arts Track– Come prepared to expand your skills in the supportive atmosphere of fellow artists and expert instructors—yours truly and fine artist and print maker Sherrie York. Hog Island’s quiet coves, rocky inlets, and old growth spruce forest provide opportunities for both exploration and art. Daily skill building sessions will cover techniques for drawing and painting, with a focus on nature journaling, birds, and landscapes. 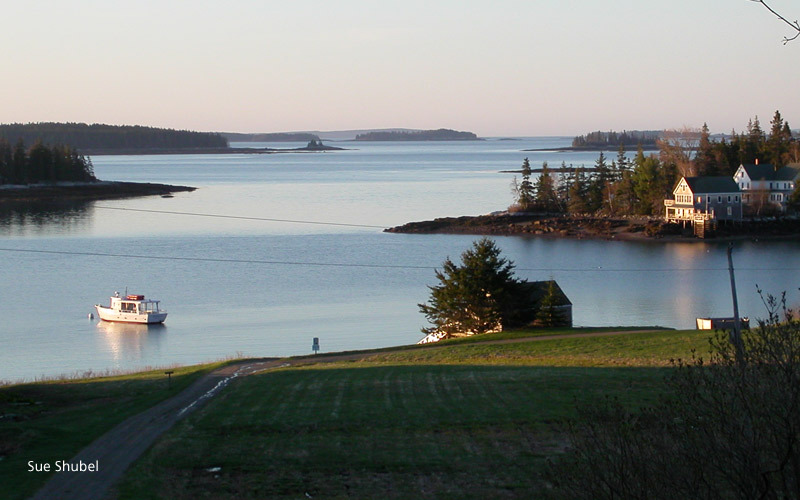 About Hog Island– The island is just a short boat ride from the mainland, but it’s a world apart altogether—no cars, no shopping plazas, no houses, just 300 acres of Maine coastal spruce forest, rocky coves, and fantastic views in all directions. Handsome camp buildings that date to the 1890s, but updated with modern amenities, are concentrated at the tip of the island. This unique sanctuary has been offering education programs to adults and youth under the auspices of the National Audubon Society since 1936. Visit the Hog Island website for additional details and registration, and don’t hesitate to ask a question in the comments or via email: jeanmackay(dot)art(at)gmail(dot)com. I’ve seen a good number of ospreys over the years, but never one so close. 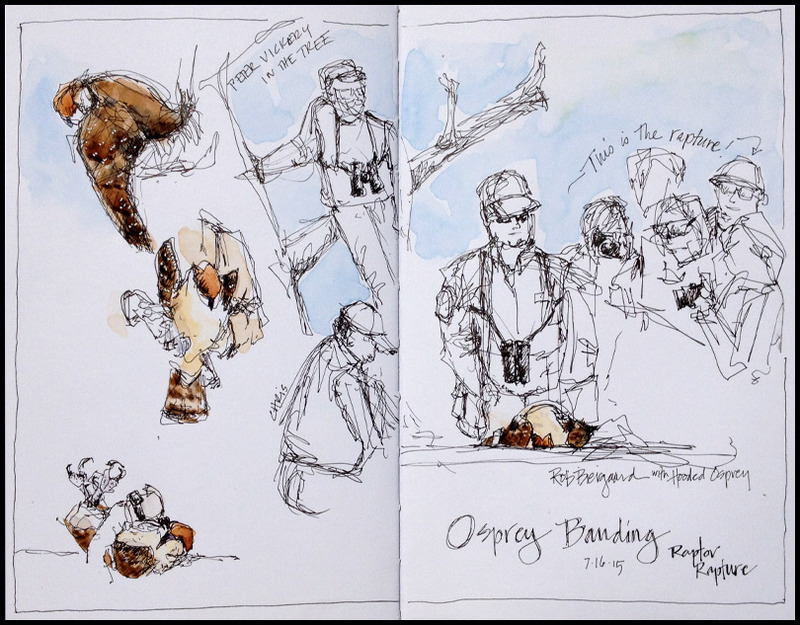 Hog Island instructor and osprey expert Dr. Rob Bierregaard and Chris Desorbo, a wildlife biologist at Maine’s Biodiversity Research Institute, banded this juvenile to the delight of camp participants. Ospreys are common on the Maine coast, thanks to the work of dedicated conservationists who brought them back from the brink of population collapse in the 1970s. As countless cameras zoomed in, I decided to try my hand at sketching the scene. I had been encouraging participants to try quick ink sketches, so it was a perfect opportunity to practice what I preach. I went back in later with watercolor and painted only the osprey to highlight the star of the show. I did the first sketch (top) using a photo that I took after Rob and Chris finished banding the bird and its hood was off. I started with a pencil sketch, then outlined in ink, painted with watercolor, and finished the page with the text. Researchers outfit young osprey with lightweight aluminum bands on their legs. The bands contain identifying information which is later recovered. 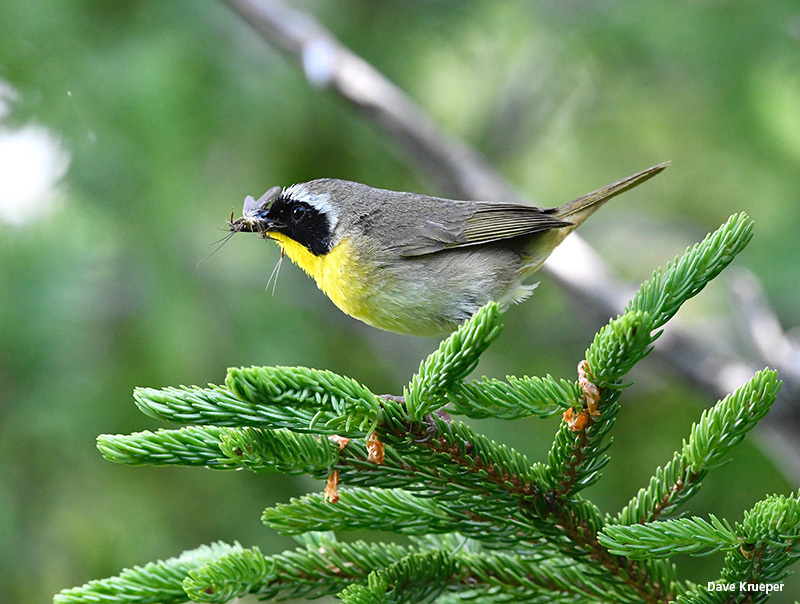 Banding studies reveal critical information about sources of avian mortality, where birds migrate, how they disperse, and how long they live.